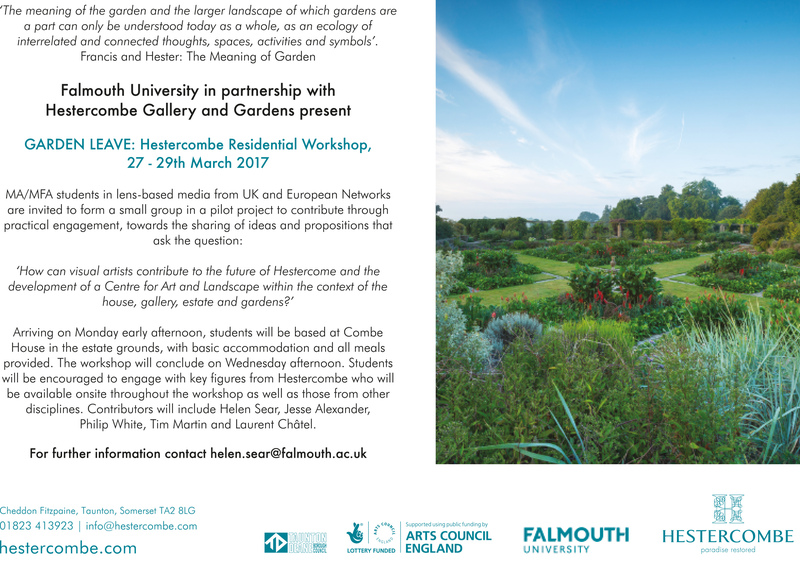 I was very fortunate to be invited to take part in a residency at the vibrant Hestercombe Gardens in Somerset from March 27 to 29. Led by Helen Sear, Professor of Falmouth University’s Institute of Photography and Tim Martin, Hestercombe’s curator, with talks provided by my own MA course leader Jesse Alexander; course leader for MA Photography at Plymouth University, Liz Nichols; Philip White, CEO of Hestercombe and Dr Laurent Chatel, senior lecturer at the Sorbonne, Paris and a Visiting Fellow at Oxford University, this three-day opportunity provided the time and space to not only assist in art idea creation for Hestercombe but allowed time for me to reflect on my own practice. The venue is a fascinating blend of historical gardening and this was reflected in the discussions inspired by Laurent and Philip, while the tutors and attendees showcased an array of visual interpretations to the ‘natural’ world. Walking the grounds and hearing the stories of the past helped cement for me that what has been can be the grounding for future innovation. There is no need to be stuck in the past but by remembering it we can be inspired anew. 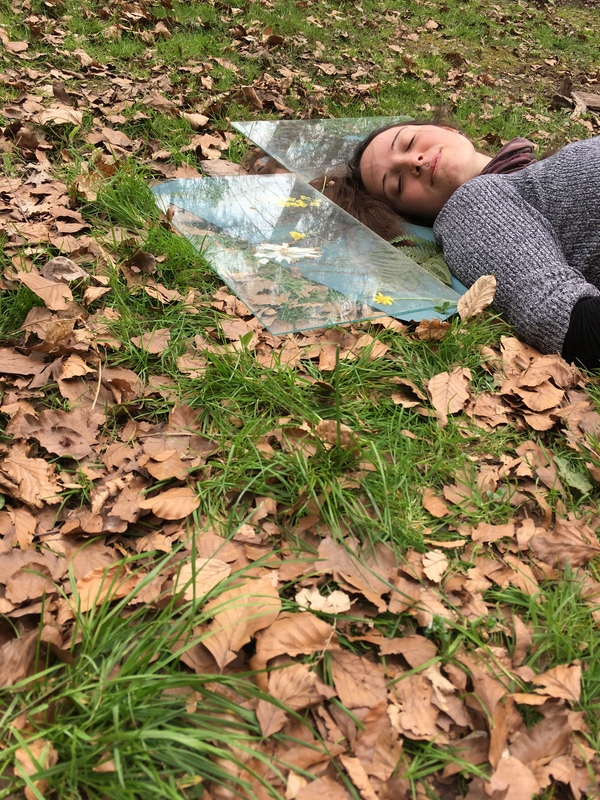 There are so many opportunities for Hestercombe to develop itself as a centre for arts, but one of the overriding feelings coming from the group was not to try to be all things to everyone. I can almost feel this resonating in my own work. I want my art to accessible and showcased in a way that will spark conversations for as wide an audience as possible, yet I do not want it watered down that it loses it voice. 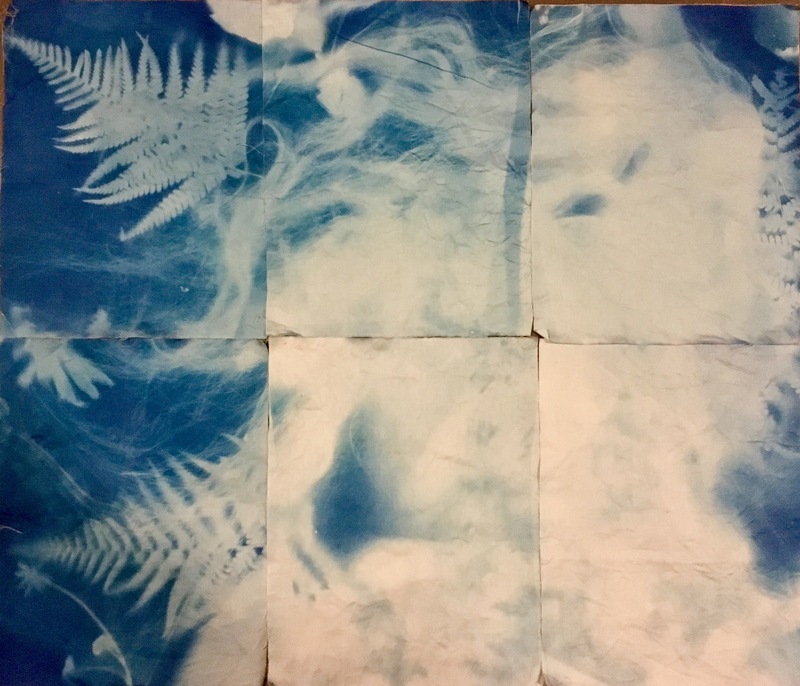 While at Hestercombe, I had the chance to respond to my surroundings and opted to create a cyanotype on fabric using found flora and the waterfall, and of course, Helen’s amazing assistant Kate Mercer as my model. This inspired an idea to create a cyanotype ballgown, worn by an automaton that can roam the house looking for the night of the 1897 ball when it first had electricity. Just need to be invited back now. Working outside within nature and using nature itself to make photographs is what drives me more and more. Being able to work in a place that combines rural history and future nature-inspired adventure was a great experience. But also meeting with other creators, photographers and artists is a fantastic way of combing ideas and suggestions. Two of the students had a penchant for combining the sounds of their surroundings and this I’m sure could create a wonderful soundscape to compliment the visual experience. I hope that Hestercombe felt inspired by those who attended; I did. It may have even been worthwhile staying a tad longer as day three felt the turning point for group bonding and potential collaborations. We plan to keep in touch as a group and I hope to see as many of those who took part in the future.